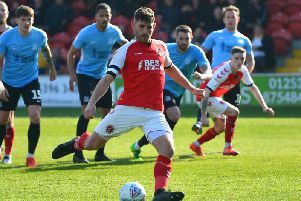 Fleetwood Town boss Joey Barton is excited to see what the future holds for Wes Burns after the Welshman signed a new deal with the club. The 24-year-old arrived in January 2017 from Championship club Bristol City on a three-year deal. He has now put pen-to-paper on a new deal which will keep him at Highbury until the summer of 2021, with the club holding an option for a further year after that. The versatile attacker has featured as a striker, winger, wing-back and right-back, and has even made a cameo at central defence during his 102 appearances in all competitions, scoring 17 goals for Town. The Welshman’s blistering loan spell at the end of the 2015-16 season saw Town splash the cash to secure his services permanently the following year. Burns has become one of the first names on the teamsheet since Barton took charge in the summer. He has featured at right wing-back and right-back in recent weeks as head coach Barton looks to develop the paceman as a defender. Barton was full of praise for seven-goal Burns and said: “We are really pleased to see Wes commit his long-term future to the football club. “Since I’ve come to the club he’s been first-class. Wes has become a key part of our squad and is a popular member of the dressing room.